“Gulab Jamun”, the very term makes me drool I am always happy to make Gulab Jamun as it is the only sweet that Chotu really loves!! 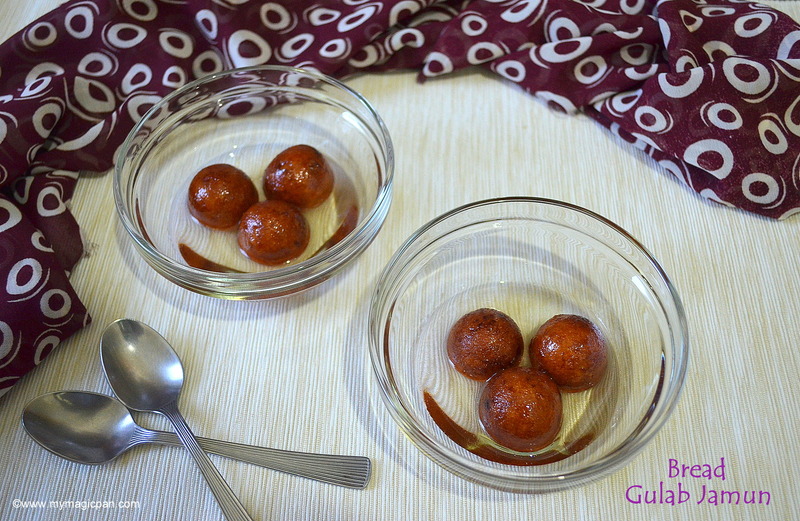 I wanted to try this instant Bread Gulab Jamun since a long time. As always, I had a pile of left-over bread to be used immediately. So this was the right time to try.. 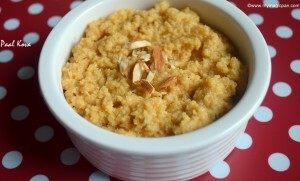 Here u go with this sumptuous and easy sweet as a Holi Special Recipe!! Milk Peda or Kesar Peda is my all time favourite, be it plain or with a mild flavour of kesar or chocolate flavoured… The list goes on.. 🙂 It would be my first choice to pick from an assorted sweet box. 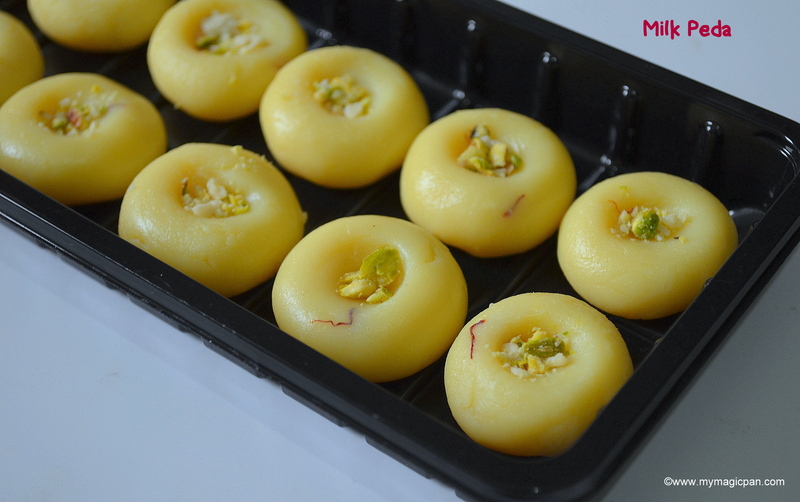 This milk peda is an instant version with very few simple ingredients that can be made in 15 mins. Its a straight forward and simple recipe and requires no consistency checks. How cool is that? 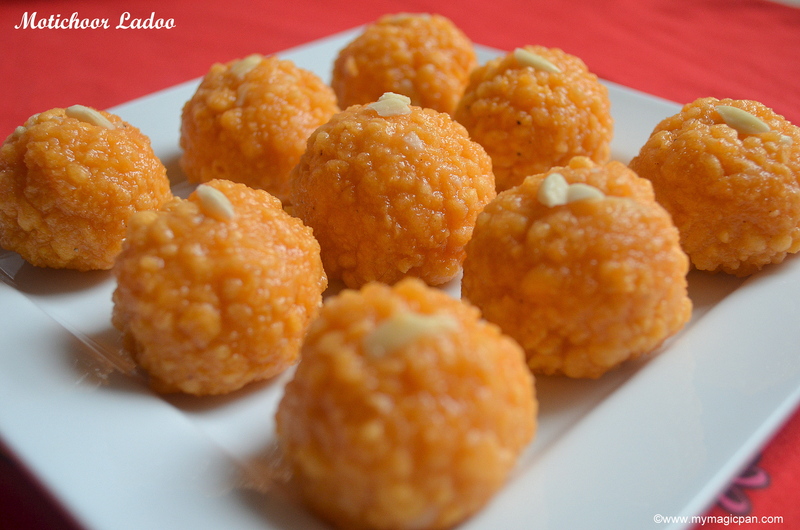 If u are looking for some easy sweet to make in the last minute, this is the perfect one..
Ladoo – the name itself is very tempting to me or any sweet for that matter. We do not have much options to get sweets here. Especially Motichoor Ladoo is very difficult. Chotu is a big fan of Motichoor Ladoo and it all started last year when we were on a vacation to India. He got attracted to these ladoos after watching Chota Bheem cartoon on TV. From then on he just loves it. This made me to try these motichoor ladoos at home. Its very easy to make. Trust me if I can make it, u can too.. So why not try this for Diwali?? 🙂 🙂 🙂 U may wonder why I am beginning this post with a smiley!!! Its my 100th post!!! Yes!!! I cant believe it myself.. Would like to thank each one of you for all your support & encouragement!!! 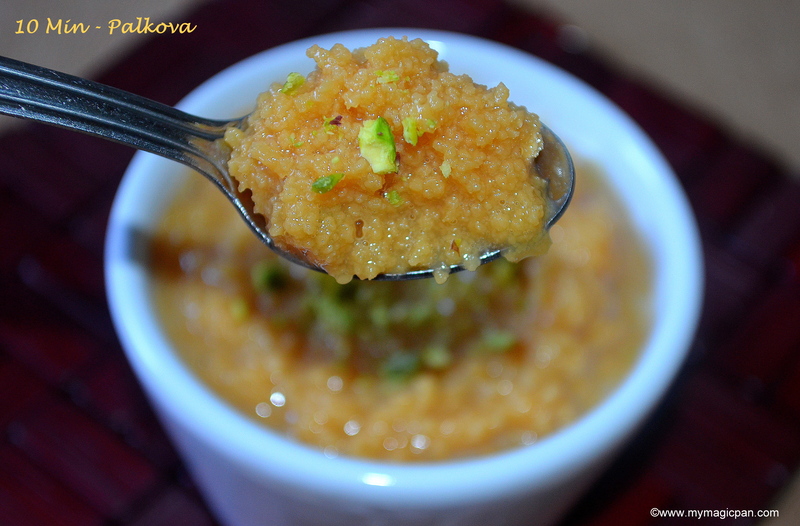 To celebrate it, I am posting a simple & quick sweet – 10 Min Palkova!!! Cant believe it?? This can be made in just under 10 mins. This is a perfect sweet for sudden cravings. Potato is an universal favourite. Have u ever tried making a sweet/dessert with it? Trust me – It tastes delicious. I had been waiting to post this Aloo Halwa / Potato Halwa for a long time. Its my favourite since my childhood. It is a very easy & quick dessert. 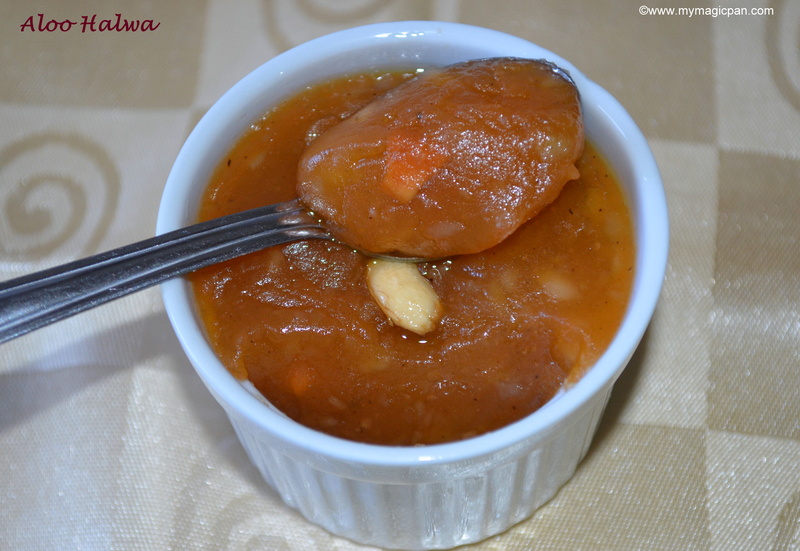 I do not wait for any ocassion to make this aloo halwa. Whenever I want to have a quick dessert, I make this!! 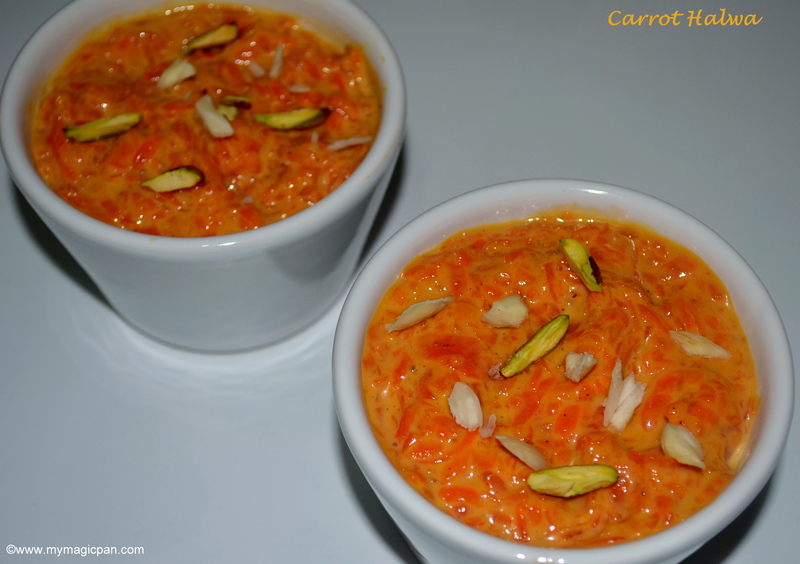 Carrot Halwa or Gajar Halwa is a popular Indian dessert made with carrots, milk & ghee. There are many versions of making it. This version is a very simple & quick one that can be made in a jiffy in a microwave. This is a NO FAIL recipe with very less ingredients. Badam Burfi is an easy and quick Diwali sweet. This version can be done in a jiffy in a microwave. So u dont have to spend a lot of time in the kitchen. Unlike the traditional method u dont have to worry about getting the sugar syrup consistency correctly. Is that not good news? 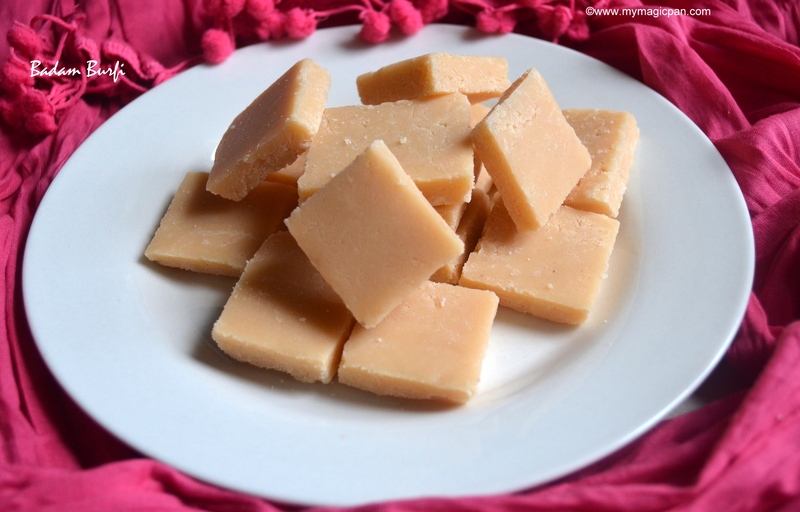 Paal Kova is a popular and traditional South Indian sweet. The best place to get the authentic Paal Kova is from Alwarthirunagari. The process of making is simple, but it is a time consuming recipe. The taste is worth spending so much time.. I would suggest to use a heavy bottom pan, so that the milk does not get burnt at the bottom. U can leave the milk in simmer, stirring it in intervals. When I make Paal Kova, I plan it such a way that am in the kitchen (cooking something else too) so that u need to spend your time only making this.